The purpose of the course is to update the skills of inpatient providers with a focus on common problems in clinical care. The format consists of brief, directed presentations followed with the opportunity to ask questions. This format guarantees question-and-answer interaction time between faculty and attendees. Target Audience: Physicians, nurses, social workers, chaplains, attorneys, teachers, and other professionals involved in the care of patients or the education of providers. This annual one-week Seminar is an intensive, interactive introduction to the four-box method of analysis of ethical problems in clinical ethics, developed by Jonsen, Siegler, and Winslade in their book CLINICAL ETHICS. The Seminar also introduces the Core Competencies in Health Care Ethics Consultation. Lectures are designed to familiarize participants with basic definitions and arguments in each of the major topics of clinical ethics. In addition, the Seminar aims to provide participants with skills and information sufficient to enable them to make competent ethical decisions in clinical situations and to assist others in doing so. Hence, careful attention is paid to methods of case analysis and to discussion of cases. The Seminar has always attracted a mix of participants that resembles the actual participants in clinical care, making it possible to share different, but complementary views. 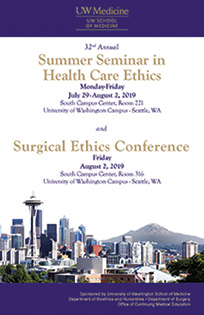 To register for BOTH Summer Seminar in Healthcare Ethics AND Surgical Ethics, select the Summer Seminar + Surgical Ethics option. This can be found under the main Summer Seminar in Healthcare Ethics registration option. Click here for driving, parking and walking directions to the venue. Target Audience: Surgeons, anesthesiologists, surgical nurses, physician assistants, social workers, and hospital administrators. Surgical Ethics Conference: This one-day conference employs the methods of ethical analysis taught in the Summer Seminar to analyze topics of special interest to surgeons, anesthesiologists, surgical nurses, physician assistants, social workers, and hospital administrators. Lectures tailored to surgical specialties define ethical principles and concepts. Multi-disciplinary panels and small group discussions allow participants to better understand the ethical debates that bear upon each topic. In addition, the conference introduces participants to skills and information sufficient to enable them to make competent ethical decisions in clinical situations. To register for BOTH Summer Seminar in Healthcare Ethics AND Surgical Ethics Conference, select the Summer Seminar + Surgical Ethics option. This can be found under the main Summer Seminar in Healthcare Ethics registration option. 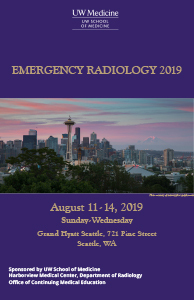 Emergency Radiology 2019 will provide comprehensive presentations and interactive discussions covering the broad range of emergency imaging, including epidemiology and mechanisms of trauma, clinicians' expectations of imaging and an integrated imaging approach to injuries of the head, neck, spine, torso, pelvis and appendicular skeleton. With the aging of the American population and increases in access to affordable healthcare, primary care providers are increasingly caring for urologic disease. 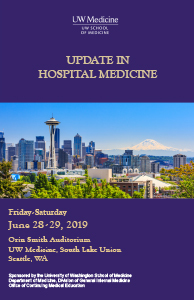 An internationally acclaimed faculty has been assembled to provide this update, with presentations on topics such as prostate, bladder, and testicular cancer, hypogonadism and testosterone replacement, sexual dysfunction, voiding dysfunction, kidney stones and genital pain syndromes. 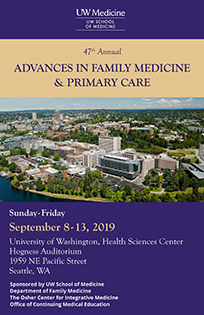 This is the 47th year that the Department of Family Medicine at the University of Washington School of Medicine is offering five days of educational opportunities for family medicine and primary care health care providers. We have an exciting program this year, with a NEW Sunday pre-conference titled "Integrative Medicine in Primary Care: Expanding the Non-Pharmacologic Toolbox in Holistic Care," which is brought to you by the Osher Center. 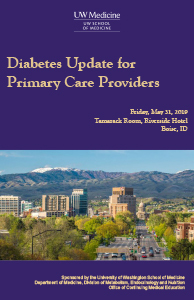 Two outstanding Keynote speakers who are inspiring pioneers in the field, will start your week of with information you will not want to miss with presentations discussing the evidence of non-pharmacologic strategies that can help overcome chronic conditions. Topics covered include management of stress, digestive health, migraine, palliative care, the role of cannabis, acupuncture, biofeedback and epigenetics. Throughout the week, talks on important primary care clinical updates including a hands-on suturing workshop, physician burnout, and buprenorphine waiver training are just a few of the over 60 topics presented with a variety of interactive workshops to reinforce and deepen content that is shared in large group plenary sessions. Physicians and advanced practitioners have the privilege and duty to care for patients at the end of life. Sometimes their actions—including discontinuing life-support (including ventilators, cardiac devices, and dialysis), clinically supporting patients who voluntarily stop eating and drinking (VSED), providing palliative sedation, and, in states where it is legal, prescribing a lethal dose of medication to a dying patient—factor into a patient’s death. These cases have clinical, legal, ethical, sociocultural, spiritual, and psychological dimensions that are often challenging for physicians and advanced practitioners to navigate. 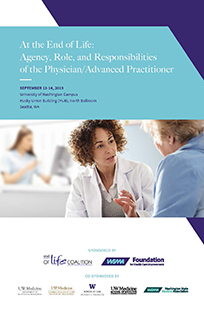 At this conference, we'll set the stage for ongoing discussion of these practices and the issues physicians and advanced practitioners caring for dying patients often face, as both medical technology and patients’ requests for planned death evolve. The Washington End of Life Coalition—sponsored by the WSMA Foundation for Health Care Improvement—is partnering with the UW School of Medicine Department of Bioethics & Humanities, Cambia Palliative Care Center of Excellence at the University of Washington, and UW School of Law to present this national conference on the physician/advanced practitioner’s agency, role and responsibilities at the end of life. This four-day program will cover data supporting guidelines, recommendations and recent advances regarding therapeutic options for patients with solid tumors and hematologic disorders. At the end of the course, physicians will leave with a comprehensive syllabus, a self-assessment, and a deeper understanding of the pathogenesis, diagnostic evaluation and therapeutic modalities available for a breadth of solid tumors as well as hematologic disorders. There will be a case-based review session and discussions. The course is designed to help prepare you for certifying and re-certifying exams as applicable. The North American Workshop on Ultrasound in Large Vessel Vasculitis is a course designed to provide basic training for the rheumatologist in performing vascular ultrasound for the diagnosis of large vessel vasculitis. Intermediate to advanced skill in the performance of ultrasound is strongly recommended as a prerequisite to this course. The format for this course will consist of 15 hours of instruction over 3 days, with 6 hours of didactic teaching and live demonstrations and 9 hours of supervised hands-on scanning of models and patients with large vessel vasculitis. This course is designed to provide the learner with the most up-to-date review of cardiac implantable electronic device lead management. Topics covered include indications for lead extraction, clinical decision making in patients with CIED infections or lead malfunction. An in-depth review of indications for lead extraction will be covered, as well as a description of available tools and technology used for lead extraction. Experts in lead management and extraction will discuss cases which illustrate the educational goals. Didactic sessions will be combined with interactive case presentations.